Another new recipe I tried in 2017! 1. Heat up the jelly powder, sugar, and water in a pot until the sugar melts; not necessary for the water to boil, as long as the sugar melts. 2. Pour in the susu cair. Let it boil. Yes, until mendidih then tutup api. 3. Add in the fruits. Make sure to drain them first. We only want the fruits. 4. Pour it into your jelly mould, kalau tak ada tuang je in any baking pan, like I did. I also pour some into tiny plastic tupperwares. 5. Let it cool for a while before putting it into a refrigerator. 6. Potong ikut suka and ready to serve! 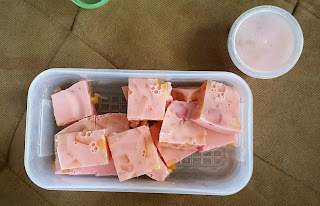 I used a Red coloured jelly powder, added with the white susu cair, my jelly turned out a nice pink colour. I read up in one blog, she cut out the fruits into smaller pieces before putting them inside the jelly. You can do so as well if you want to jimat a bit on the fruits. In case you didn't notice, mine got a lot of bubbles... Asked mum about it and she said I could just simply remove the bubbles; scoop it out with a spoon before letting it harden up. Thank you for sharing. I'll try it.